When the debt load you’re carrying is simply too much to bear, you might have considered filing for bankruptcy protection. Filing for bankruptcy has become increasingly common the past three years thanks to the economic downturn and job cuts across numerous industries. The American Bankruptcy Institute reports that about 1.5 million personal bankruptcy cases were filed in the U.S. in 2011 alone. Even though filing for Chapter 7 or Chapter 13 bankruptcy can help you get a better handle on your finances and even give you a “clean slate” to work with, the filing process can be complicated and your case may end up being rejected by the bankruptcy courts if you’re not careful. The courts typically reject cases outright when they see obvious omissions or errors in your paperwork. But there are some other key reasons why the court will just end up saying no to your bankruptcy petition. You will need to provide a set of financial documents to support your case, including your federal and state income tax returns. If you misrepresent your tax information or don’t provide all of the requested tax documents, you court can reject or dismiss your bankruptcy case. Requirements on what types of tax documents you need to provide vary by state so it’s a good idea to check in with a bankruptcy lawyer. 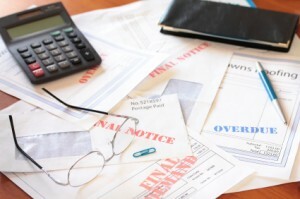 Some people contemplating bankruptcy feel a moral obligation to pay their debts. So rather than have file Chapter 7, they use Chapter 13 bankruptcy, also known as the “wage earner” plan. When you file for Chapter 13 bankruptcy, you propose a repayment plan to pay off some or all of your debts over three to five years. If you suggest a repayment plan that is unrealistic and clearly something that you can’t keep up with, the courts can reject your case. Everyone who files for a Chapter 7 bankruptcy has to pass the “means” test imposed by the court. This test determines exactly how much disposable income you have. If the court finds that you have a high disposable income, they can reject your request because you can clearly afford to pay off your debts. You will need to attend a meeting with the bankruptcy trustee and creditors to answer questions (under oath) about your assets and liabilities. If you have a lawyer, he or she will typically go to this meeting with you. The meeting usually only takes about ten minutes and is scheduled about a month after you file for bankruptcy. If you don’t show up, your case will be dismissed immediately. When someone tries to prove that you’re not truly eligible for a bankruptcy discharge and wins their case, the courts can dismiss your bankruptcy petition. For example, if you made false statements at some point, failed to appear for your mandatory credit counseling, or are guilty of hiding assets, you may be challenged in court and denied your request.